GENEVA, Switzerland, January 31, 2014/African Press Organization (APO)/ -- The Cartier Women's Initiative Award (http://www.cartierwomensinitiative.com) is a business plan competition aimed at supporting creative, financially sustainable and responsible women-led companies, in all countries and industries. 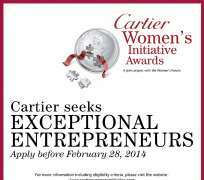 The Cartier Women's Initiative Award is an entrepreneurship competition for start-ups led by women organized by Cartier in partnership with McKinsey & Co., and INSEAD business school. The Award will be given to six laureates, one by geographical region, who will receive a year of coaching, US$ 20,000 in funding, valuable networking opportunities as well as media exposure. Applications will be accepted until February 28, 2014. Entrepreneurs are invited to submit a short business plan using the online application form. The projects must be between one and three years old. All applications must be submitted online in English. Application deadline: February 28, 2014 at 10am Paris time (CET). As it cannot be extended, please verify the corresponding deadline in your time zone. Eighteen finalists representing the best projects worldwide will be selected in the first phase of the contest. They will receive coaching and media exposure and will be invited to France for the Finale week which includes a presentation in front of the international Jury, entrepreneurship workshops and the Global Meeting of the Women's Forum. The six Laureates nominated for the Awards receive one year of coaching, US$ 20 000 in funding, media visibility and networking opportunities. • The main leadership position must be filled by a woman. The competition is open to women from any country, nationality and industry. Contact details and resumes of lead entrant and team members. Download the full list of questions online. Distributed by APO (African Press Organization) on behalf of Cartier International.